Russell Fuel Pressure Regulator UNIVERSAL - Dezod Motorsports Inc - Home of the automotive performance enthusiast since 2002. 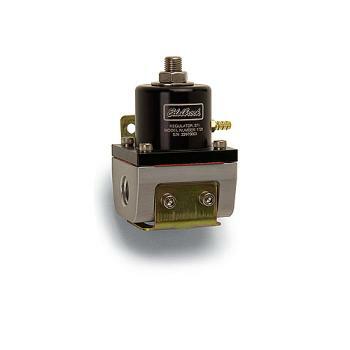 Manufactured by Essex Industries, these fuel pressure regulators are machined from aircraft quality aluminum and have fluorosilicone diaphragm material for extended life and high temperature protection. They are compatible with all grades of gasoline/methanol and have 1/8” NPT gauge ports. Mounting bracket and hardware are included. #1727 has 3/8” NPT inlet/outlets and is adjustable from 5 to 10 psi, providing extremely consistent pressure regulation for carbureted applications. #1728 and #1729 are adjustable from 35 to 90 psi & capable of handling the flow from pump #1794 or two #1790 pumps for systems well beyond 1000 hp. These kits allow for the adjustment of fuel pressure from 4-1/2 to 9 psi. Match with Edelbrock racing fuel pumps. Kits include fittings, mounting plate, fuel line and regulator. Fuel line from fuel pump to regulator is not included; use #8122 or #8127 for pumps with 1/2” NPT outlet.